Wow! WhT an amazing quilt! gorgeous! Hey it is growing, excellent creation. Love the one side…hope you sort out how to fix it to match what you see in your head…It is making my poor concussed brain hurt to think you have to do Math to make your quilt! It must be worth it though cuz it looks great so far…Nice and colourful and quirky! What a wonderful quilt, love ALL the colors and I like the pattern you have, even though it isn’t your sunburst. Your quilt is so bright and colorful!!! Love it. And I had to laugh when I seen your floor… it’s as bad as mine!!! Anyway, looking forward to your finished quilt. Happy WOYWW! 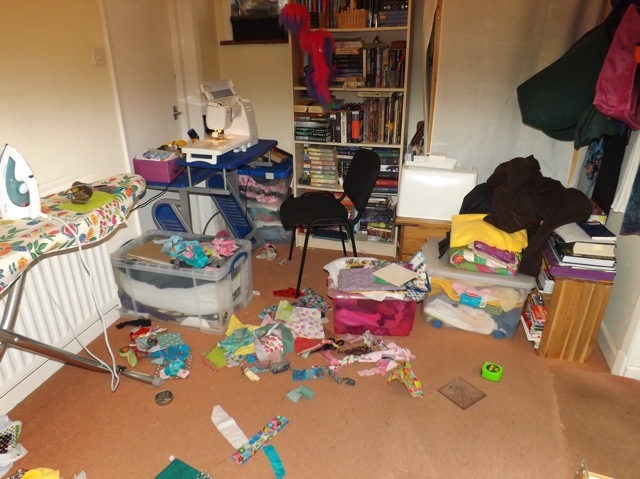 Oh – I’m glad to see another craft room that looks a bit like mine – how is it the work surfaces fill up so quickly, leaving you no option but to use the floor!? That will be a great quilt when you get it all sorted and worth all the effort. Wow! your quilt is just stunning! It will certainly be a treasured keepsake! love jo … in haste ,in Brighton! Your quilt is beautiful, you are so clever, I am not showing you my floor! Oh my! I’m glad I’m not the only one who spreads across the floor LOL! Your quilt is looking fab, such lovely colours. You are so inspirational! I can’t believe you did all that in one day (along with the usual activities of life with a family). I love the bright colours! WOW! What a complicated quilt you have got up too! Looks beautiful – all the colors I like but to be honest I could never do it! I am still building up the courage to do the simplest of quilts possible so this is high tec for me! 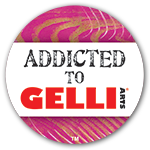 Thank you for sharing – really love it! My goodness you really are o n a mission!! I’ve been watching your storage escapades for weeks and now you are going to start on the books! I am afraid I have been rather ruthless with mine the last few years – I am getting out of the mindset of just ‘having’ them. It’s hard though because I am a natural hoarder. Although I haven’t made one for 20 years I do have a great fondness for quilts as this is what my mum does periodically with all her scraps and they always contain remnants from years ago that you had forgotten about. Aah. memories!! The quilt looks lovely and yay I have learnt another acronym or whatever it’s called. QAYG. Could catch on. 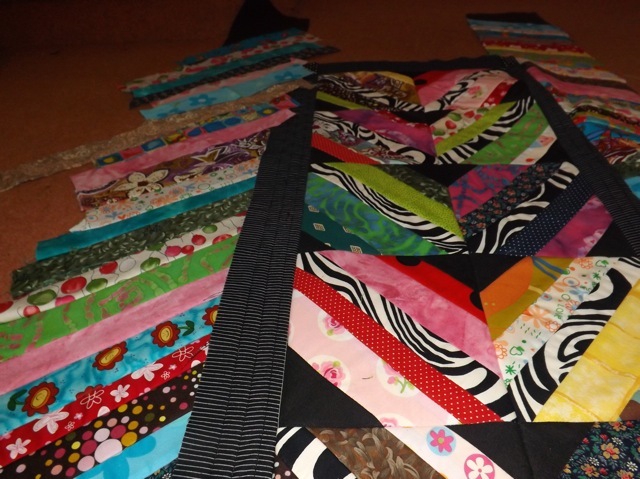 Youare loving it really – you couldn’t possibly just make a quilt like I have from HUGE pieces that don’t realy qualify as scraps…you gotta get the technical involved! It looks really great, so vivid. A cull of books. I understand and say ‘good luck’ with that; I did one last year and found it more painful than stash culling to be honest. Still looks like you are having fun there though! I love sewing – keeps my brain cells working I think! 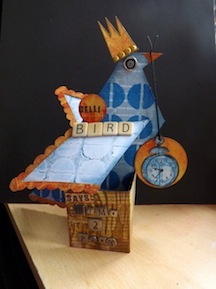 What a fantastic effort to make it all from scraps and get it to look so fantastic. Love the different colors and patterns. 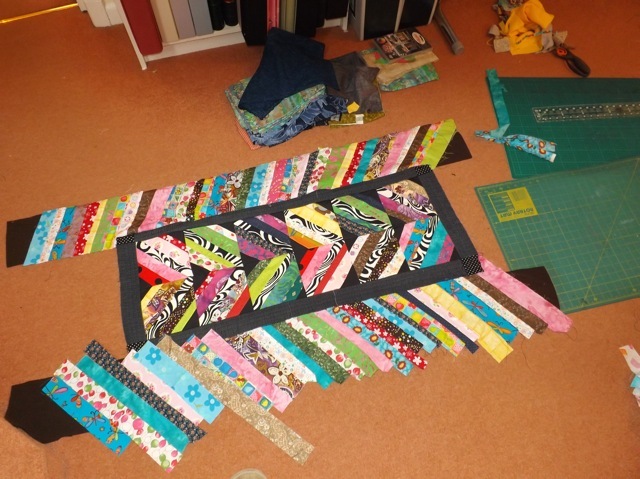 At last able to WOYWW again …Some lovely work going on here, just adore the quilt had look at the other link too! Your quilt is breath-taking! Seriously… it is so beautiful. Personally, I’d have chosen the chevron rather than a sunburst effect anyway – it just looks so amazing. The quilt is coming along a treat and I do know the feeling of what you have in your head and what it turns out like in the end. But your quilt is beautiful. Oh I do love your floor! Looks just like mine (both in the basement stamp area AND the attic sewing area!). Your quilt is very pretty, so at least you are being most productive. Thanks for sharing, and hope you will post a picture when you are all finished.